Region: This wireworm can be found in eastern North America, but similar species can be located throughout North America. Life cycle: The Wireworm produces one generation each year and overwinters as an adult within cells in the soil. The entire life cycle requires anywhere from one to six years to complete. Physical Description: The wireworm is only about 1/2 an inch long and is yellowish brown tube-like body with a shiny, hard skin. The adult wireworm varies from brown to a gray to black color and has dark marks on its head and wing covers. It is very similar to a millipede. Its eggs are laid beneath the surface of the soil at a depth of several inches. 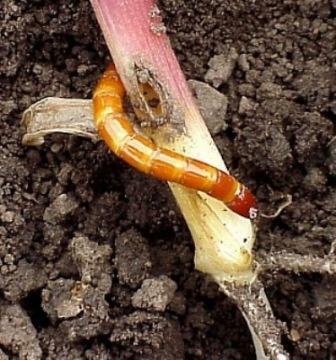 Feeding characteristics: The Eastern Field Wireworm will attack bean, beet, cabbage, carrot, corn, lettuce, onion, pea, potato, and turnip plants. These chewing insects eat entirely under the soil, eating germinating seeds and the roots, tubers and underground stems of plants. Controls: Potatoes are attractive to the wireworm and can be used to trap them. Simply cut a potato into chunks and spear them with sticks. Place the potatoes under the soil, about an inch, with the stick pointing up for a handle. Leave in the ground for a day or two and then pull them up. Drown in a bucket of water and dispose in the compost pile. You can trap quite a few wireworms with this method. Thorough cultivation makes conditions unfavorable to the egg-laying adults and exposes the insect to the elements. You can keep the wireworm to small numbers by planting clover or another Green Manure Crop, but hay mixtures support the insect. Avoid planting crops known to be favored by the wireworm and rotate in a crop of potatoes every three to four years. In the Northwest, farmers grow alfalfa for three years, then one year of potatoes, and then move to a suitable vegetable crop.